Meet Peter Blake, the famous New Zealand yachtsman, who won the world's most famous yacht races and worked to help save the world's precious waterways. Sir Peter Blake’s life was filled with amazing adventures. During his 30-year career on the ocean, he sailed around the globe, won the world’s most famous races and broke records. Even his red socks became a national sensation. But no matter how many trophies Peter won, he always knew the survival of our planet was more important. The co-creators of Hero of the Sea interview each other about writing, illustrating and their latest collaboration. Use the key to unlock the secret message! 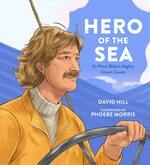 Love Hero of the Sea? Subscribe to Read More to find out about similar books.